We used the forest inventory data of Gansu Province, China to quantify carbon storage and carbon density changes by regional forest cover and by typical forest types in 1979–2006. 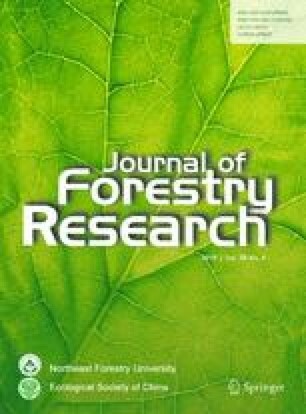 Total forest area increased from 1.77 × 106 ha in 1979 to 2.32 × 106 ha in 2006, and the forest carbon storage, estimated by the continuous biomass expansion factor method, increased from 83.14 to 100.66 Tg, equivalent to a carbon accumulation rate of 0.0071 Tg per year during the period. Mean carbon densities were 44.83–48.50 t ha−1 and the values decreased slightly over the time period. Natural forests generated greater carbon storage and density than did plantations. By regression analysis, forest stand age was an important parameter in carbon density studies. We developed various regression equations between carbon density and stand age for major types of natural forests and plantations in the region. Our results can be used for proper selection of re-forestation species and efficient management of young and middle-aged forests, offering great potential for future carbon sequestration, especially in arid and semi-arid regions. Project fund: This work was financially supported by the Chinese Academy of Sciences through the Strategic Priority Research Program (XDA05050202). This research was supported by the Chinese Academy of Sciences through the Strategic Priority Research Program (XDA05050202). The forest inventory database of the State Forestry Administration of China is gratefully acknowledged.